Because you and your company deserve it! The industrial sector is one of the most important economic sectors in Jordan. More than 18000 industrial units employ more than 260 000 employees in total. 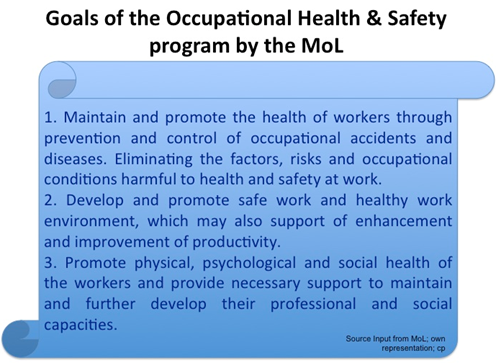 With the attempt to upgrade the industrial sector in Jordan, under the aegis of the Ministry of Labor (MoL) the dedicated training program for “Occupational Health & Safety” was developed. … with increasing number of workers the number of health & safety officers and supervisors has to be adapted too. Overall, the Occupational Health & Safety Program intends to minimize human risks and material losses, thus, being considered as equally necessary for enterprises and employees. Since 2016, the MoL has started several awareness campaigns and has increased regular visits of official inspectors to the companies in order to follow-up the implementation-progress of the law. Depending on the inspector’s risk evaluation of the factory, counteractive measures for violations are taken. Penalty fees may vary between ca. 100 JD - 500 JD at least. The worst-case scenario is the immediate close-down of the company. In May 2016, EJABI received accreditation from the Ministry of Health to be official provider of the ministry-acknowledged training program. The training and further education program as mandatorily introduced by the Ministry of Labor (MoL), encompasses 270 hours. 230 hours belong to the theoretical part, and 40 hours are practice-oriented. The practice sessions are regularly designed as field-visits to various factories, underlining the necessity and importance of on-site experience and discussion.